This site is being updated on a regular basis. Please check back often for the most up-to-date information as we get closer to Poly Royal! April 12-13, 2019. We hope to see you there! Where can I stay during Poly Royal? Click here for available lodging in San Luis Obispo County. The hotels fill up fast during Poly Royal weekend, so consider booking your room today! Are there any items that are prohibited from Alex G. Spanos Stadium? Yes. Please see the University Police Department's list of prohibited items here as we are implementing a clear bag policy in Spanos Stadium for Poly Royal. Will there be kids’ activities during Poly Royal Rodeo? What's the difference between a Poly Royal Premier Sponsor and a Booster VIP? Premier Sponsors are those individuals who are sponsoring this year’s Poly Royal Rodeo at a $5,000 level or higher through the Poly Royal Rodeo Partnership Program. This includes Mustang, Bronze, Silver, Gold and Legacy-level sponsors. Poly Royal Rodeo Premier Sponsors receive benefits as a part of their sponsorship package. Their donations are made directly to the Cal Poly Rodeo Program and processed by the Cal Poly Foundation. In addition to Premier Sponsor levels, Cal Poly Rodeo offers opportunities for individuals or corporations to support the program at other sponsorship levels, including Traditional Booster (often referred to as Booster VIP) levels. Please see the 2019 Partnership Program for more information on benefits and levels. What is included with my Premier Sponsor status? Premier Sponsors will receive a packet with a Premier Sponsor parking pass and a designated number of Premier Sponsor wristbands per night (based on specific sponsorship level) to get into the stadium and enter the arena-side Premier Sponsor area. The Premier Sponsor area in Alex G. Spanos Stadium includes complimentary food and beverages and will open two hours before each evening’s performance. Last call for alcohol will be at 9 p.m. The Premier Sponsor parking lots on campus will have shuttle service to and from the rodeo. Where and when can I pick up my Premier Sponsor packet? Premier Sponsor packets will be available for pickup at the Poly Royal Rodeo Banquet. The banquet will be held at the Alex Madonna Expo Center, Thursday, April 11, from 5:30 to 10 p.m. I can’t make it to the Poly Royal Rodeo Banquet on Thursday. How do I get my Premier Sponsor packet? Premier Sponsors will receive an email with the Premier Sponsor RSVP Survey on Thursday, March 28. You are required to provide the name(s) of the individual(s) permitted to pick up your packet. 1) Premier Sponsor packets that are not picked up during the banquet will be available for pickup at will call at Spanos Stadium both Friday and Saturday. The Premier Sponsors and Booster VIP-specific Will Call is located at the Southeast endzone of Alex G. Spanos Stadium on College Avenue. 2) You may designate a representative to pick up your materials for you at the Poly Royal Rodeo Banquet, or at the Premier Sponsor Will Call. The representative will be required to present a valid photo ID when picking up the Premier Sponsor packet. Due to the risk of materials being lost in the mail, we will not be sending packets via postal service providers. Do I have to stay in the Premier Sponsor area during the rodeo or can I move around? Poly Royal Premier Sponsors are welcome to move throughout the Premier Sponsor area and the Booster VIP area in the stadium. Premier Sponsor passes will not allow entry into the stands nor the suites. I am bringing more people to Poly Royal than the number of Premier Sponsor wristbands that were provided. Can I purchase more Premier Sponsor tickets? No. Extra Premier Sponsor wristbands cannot be purchased. If you would like to invite additional guests to Poly Royal, you may purchase general admissions tickets by visiting https://tickets.calpoly.edu. Can I use all of my Premier Sponsor wristbands for one night? No. Premier Sponsors must split wristbands evenly over the two performances. For example, Silver-level Premier Sponsors receive 8 tickets and wristbands per rodeo performance. Eight are valid for the Friday performance only, and the other eight are valid only for Saturday's performance (i.e. all 16 cannot be used for a single performance). Premier Sponsors will receive an email with the Premier Sponsor RSVP Survey on Thursday, March 28. You are required to provide guest names for each night’s performance. Security at the Premier Sponsor Area entrance will be checking names and wristbands. I am a Premier Sponsor, but I will not be able to attend Poly Royal. Can I gift my Premier Sponsor wristbands to someone else? Yes. Even if you are unable to attend Poly Royal, please complete the Premier Sponsor RSVP Survey on Thursday, March 28 and include the names of those individuals who will be attending in your absence. Invited guests will need to be on the Premier Sponsor list and have their wristband on when they check in with security. What happens if lose my Premier Sponsor Packet? Do not lose your Premier Sponsor packet. Due to the staffing demands needed to put on the Poly Royal Rodeo, we will not be able to reprint lost packet materials. After the rodeo performances, where do I go to watch the concert? Poly Royal Premier Sponsors are welcome to stay in the Premier Sponsor area for the concert or you can move to the arena floor. We hope you stay to enjoy the concerts! Will there be heaters or tents in the Premier Sponsor area? Due to fire safety regulations, we will not have heaters in the Premier Sponsor area. See recommendations for clothing below. In consideration of the views of other spectators in the stands, we will not have tents in the Premier Sponsor area. We encourage guests to check the weather forecast for San Luis Obispo during Open House weekend. Keep in mind that the Premier Sponsor area in Alex G. Spanos Stadium will be in the shade once the sun starts to set and evening temperatures can dip. We suggest planning ahead for changes in weather and bringing extra layers. We also recommend against wearing open-toed shoes or high heels as Premier Sponsor guests will be arena-side and right next to all of the action. Why did I receive a tax receipt from the Cal Poly Foundation in the mail? All partnership and sponsorship activities with Cal Poly Rodeo, including Traditional Booster options, are processed through the California Polytechnic State University Foundation. The foundation qualifies as a public charitable organization and meets the requirements of Internal Revenue Code Section 501(c)(3). Gifts to Cal Poly are deductible at the highest limits allowed for federal income or estate tax purposes. I received a tax receipt from the Cal Poly Foundation. Is this my ticket to the Poly Royal Rodeo? I paid for my Traditional Booster sponsorship online. Will the Cal Poly Foundation mail a tax receipt to me? No. Online gifts or sponsorship payments are emailed an immediate e-receipt when the transaction occurs. In addition, a receipt is displayed on your screen that can be printed or saved. Receipts for online gifts are not sent in the mail. As a reminder, this digital tax receipt is not your ticket to Poly Royal Rodeo. Why doesn't the amount on my tax receipt match what I wrote on my check or paid online? Great question! Each of the Traditional Booster sponsorship options includes a designated number of tickets to the pre-rodeo barbecue and the Booster VIP area during Poly Royal Rodeo. The cost of those benefits is deducted from the total sponsorship amount (i.e. the amount you wrote on your check). You receive a tax receipt for the tax-deductible portion of your sponsorship. It's a win-win: you get tickets to Poly Royal Rodeo activities AND a portion of your sponsorship is a tax-deductible donation benefiting the Cal Poly Rodeo program! Why am I receiving thank you cards from Cal Poly? We love our supporters! We want to make sure you know that we are thankful for your generosity. Donors and sponsors help make programs like Cal Poly Rodeo possible and we want you to know that. How do I get tickets to the Booster VIP area at Poly Royal? Anyone interested in getting tickets to the Booster VIP area during Poly Royal will need to become a Traditional Booster sponsor using one of three options. Booster VIP tickets are NOT available for purchase at the gate or through the Cal Poly Ticket Office. As a Traditional Booster sponsor, how many Booster VIP tickets do I get to Poly Royal Rodeo? Booster VIP tickets will also get you in to the pre-rodeo barbecue inside Alex G. Spanos Stadium. Can I purchase Booster VIP tickets at the gate? No. Anyone interested in getting tickets to the Booster VIP area during Poly Royal will need to select one of the three Traditional Booster sponsorship options. Can I purchase Booster VIP tickets through the Cal Poly Ticket Office? When is the last day to become a sponsor/purchase tickets to the Booster VIP area? Due to timing needed to preparing Booster VIP and Premier Sponsor materials for Poly Royal, the last day to purchase Booster VIP tickets online is Monday, April 1 (if paying by check, checks must be postmarked by Wednesday, March 27). No exceptions. What if I missed the April 1 deadline to become a Traditional Booster sponsor and I still want to attend Poly Royal? Are my tickets going to be mailed to me? No. Due to the risk of materials being lost in the mail, we will not be sending Poly Royal Rodeo tickets via postal service providers. Where do I pick up my Booster VIP tickets? During the rodeo, at the Premier Sponsor and Booster VIP Will Call at the Southeast end zone of Alex G. Spanos Stadium on College Avenue. See map for details. A valid photo ID is required to pick up tickets. Don’t forget to complete the Booster VIP Survey that will be emailed to you by Wednesday, April 3, so we know who will pick up your tickets. Yes. You must specify the name of the alternate in the Booster VIP Survey that will be emailed by Wednesday, April 3. Anyone picking up tickets must bring a photo ID. If I sponsor Cal Poly Rodeo via one of the three Traditional Booster options, does this get me tickets to the Poly Royal Banquet on Thursday night? No. Anyone interested in attending the Poly Royal Banquet on Thursday, April 11 will need to purchase a separate ticket via Eventbrite. I sponsored at the Traditional Booster Two-for-One option. What combination of tickets do I get? I sponsored at the Traditional Booster One-for-One option (one ticket for one performance). Which day is my ticket valid for? You must complete the Booster VIP Survey that will be emailed to you by Wednesday, April 3 to select the night you would like to attend the Poly Royal Rodeo. Surveys must be completed by Friday, April 5. My question was not answered here. Who can I contact to find out more information about Poly Royal? Please check out the rest of our website that includes information on parking, policies and more for the general public, sponsors and contestants. If you have additional questions, please email rodeo@calpoly.edu. When and where is the Poly Royal Rodeo Banquet? The 2019 Poly Royal Rodeo Banquet will be held at the Alex Madonna Expo Center on Thursday, April 11, from 5:30 to 10 p.m. Doors will open at 5:30 p.m. Dinner begins at 7 p.m. The event includes a steak dinner, no-host bar, live and silent auctions, and live music. We want to thank the Madonna Inn for supporting Cal Poly Rodeo and sponsoring this event! Who can attend the Poly Royal Rodeo Banquet? Poly Royal sponsors, rodeo team members, parents, alumni and friends of Cal Poly Rodeo are personally invited to attend the banquet via email. Legacy, Gold, Silver, and Bronze-level Poly Royal sponsors will receive a special email invitation to RSVP guests for their complimentary banquet tickets. How much do tickets to the banquet cost? Guests may purchase banquet tickets online for $45*. Cal Poly Rodeo and Cuesta Team members will receive one complimentary ticket to the banquet. Where can I buy tickets for the banquet? Poly Royal Rodeo Banquet tickets are available for purchase online only. Please read FAQ #2 for more information on who can attend. Tickets will NOT be sold at the door. Remember, Legacy and Gold sponsors receive a complimentary table for 8 at the banquet. Silver sponsors receive 4 tickets and Bronze level sponsors will receive 2 tickets to the banquet. You will receive a special email invitation to RSVP your guests. Is there assigned seating at the banquet? No. With the exception of reserved spaces for our Legacy, Gold, Silver and Bronze sponsors, banquet seating is available on a first-come, first-served basis. Tables seat 10 guests. Permits are required to park on campus during Open House weekend. Announcements regarding parking updates and closures can be found at the Cal Poly Open House Guest Parking and Transportation website. Complementary shuttle services will be offered on Friday, April 12 to guests staying at local area hotels. Please visit the Cal Poly Open House Guest Parking and Transportation website for timing and route information. Premier Sponsors will have access to a special shuttle service that will drop guests from the Premier Sponsor parking lots to Alex G. Spanos Stadium during the Poly Royal Rodeo. Where should I park for Poly Royal Rodeo? Poly Royal attendees with general admission tickets and park in general parking lots on campus. See the map below for additional parking lot types and locations. Special lots (i.e. Premier Sponsor, Suite, President’s Suite, Contestants, etc.) require corresponding parking permits. How do I obtain my Premier Sponsor parking pass? Poly Royal Rodeo Premier Sponsors will receive ONE Premier Sponsor parking pass valid for BOTH Friday and Saturday in their Premier Sponsor packets (see Premier Sponsor FAQ’s for information on picking up packets). Passes are valid only in Premier Sponsor lots at the Cal Poly Meat Processing Center and Cal Poly Dairy (gold lots). Passes must be displayed at all times when parked in the Premier Sponsor parking lots. Poly Royal Rodeo Premier Sponsors receive complimentary shuttle service between the Premier Sponsor parking lots and Alex G. Spanos Stadium. Premier Sponsor Shuttles will run every 20 minutes from 3-10:30 p.m. on Friday and Saturday. Is my Premier Sponsor parking pass (or other specialty pass) valid in other parking lots on campus? No. The Premier Sponsor parking pass is valid only in designated Premier Sponsor parking lots. Other specialty permits must be used in their corresponding lots. See parking map for details. I am a Premier Sponsor. Can I purchase additional Premier Sponsor parking passes? No. Due to the volume of traffic and limited number of parking spaces on campus, we are unable to provide guests with additional Premier Sponsor passes. We encourage attendees to carpool or use one of the alternate modes of transportation listed above. I have a parking pass for a different lot that I prefer to use. Can I give my Premier Sponsor parking pass to someone else? I am a Rodeo Booster. Is parking for Poly Royal Rodeo included with my Traditional Booster sponsorship? No. Only Gold Card Boosters receive complimentary parking passes for Poly Royal (see map to view lot location). 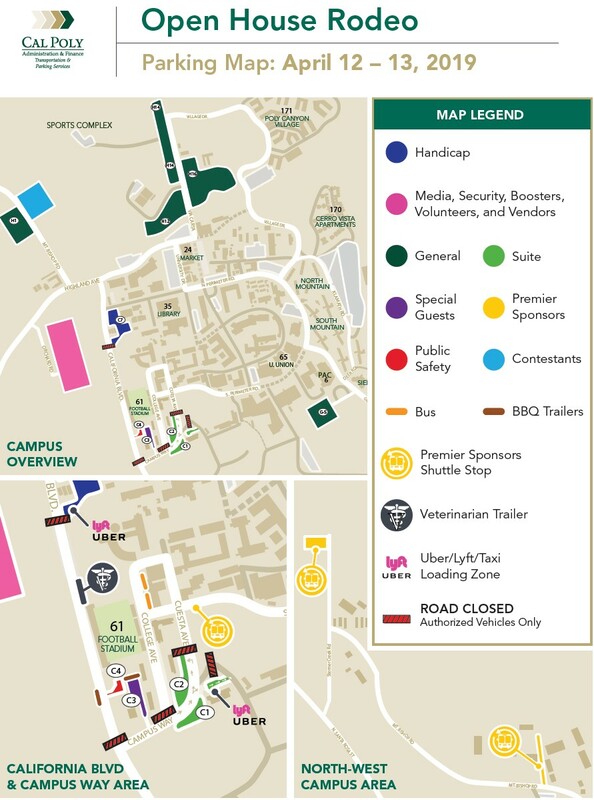 Traditional Booster sponsors will need to purchase a general parking permit for Cal Poly or use an alternate mode of transportation to get to campus. Visit the Cal Poly Open House Guest Parking and Transportation website for details on how to pre-purchase your general permit. Passes are required for credentialed members of the media. Please contact AnnMarie Cornejo for details.